Almost everyone is familiar with Dr Suess’ classic Christmas story about the Grinch who stole Christmas. Even if you were so deprived as child you didn’t own the book, you most certainly have seen Jim Carrey’s brilliant portrayal in the Hollywood movie version. As Dr Suess tells the story, because the Grinch hated Christmas he stole all the toys and trees from Whoville thinking that would put an end to it. To his surprise, come Christmas morning what did he hear? Today the Grinch has come up with a new strategy to steal Christmas that is working a whole lot better. Instead of depriving people of the trappings of Christmas, we have been over-indulged instead. Christmas has reached a whole new level of excess. Many of us run around buying gifts that nobody wants, with money we don’t have, for people we don’t like. Amidst the parties, the decorations, the lights, the turkey dinners, the eggnog and obligatory gift giving most Canadians will not be able to find even one hour to attend a Christmas church service and thank God for the gift of His Son. Many Churches have stopped even having Christmas services altogether. 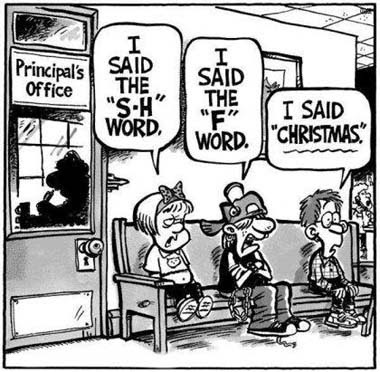 It has paved the way for the politically correct police to waltz in and quite literally take Christ out of Christmas. The cards now say, Seasons Greetings. Listen carefully, Christmas shopping is only referred to on the news as Holiday shopping. Even the lowly Christmas tree has been renamed the Holiday tree. Or in the case of the Manitoba Legislative building…the Muliti-cultural tree. Whatever the Sam Hill that means. Did you hear that the Supreme Court ruled there can be no Nativity scene may be erected in Ottawa? Oh, not for religious reasons…they just couldn’t find three wisemen in the entire nation’s capital. But, they had no trouble filling the stable with jackasses. Sorry, I couldn’t resist. Oh, I think the Grinch is very much alive and well. His strategy is working far better than it ever has before. In George Orwell’s 1984 he feared the world would be controlled by those who would inflict pain on the population. Aldous Huxley in A Brave New World believed they would be controlled by inflicting pleasure. In short, Orwell feared that what we hate will ruin us. Huxley feared that what we love will ruin us. He wrote “(they) failed to take into account man’s almost infinite appetite for distractions”. What would happen if we as Christians began to lead the way by simplifying Christmas? Instead of excessive gift giving we could find a way to serve the poor. While we are attending the office party we could offer to lead in some Christmas carols. Even rank heathens will sing these songs…everybody knows the words. Then, we could look for subtle opportunities to share the true meaning of Christmas. If you are looking for a Christmas service to attend, we have two of them Christmas Eve. One at 6 PM, the other at 8 PM. Why not plan your festivities around it. We do. We invite the family over for dinner only after they have come to church with us. It’s not a hard sell. Deep down they know that Jesus is the reason for the season. Merry Christmas everyone and remember wise men still seek him today!